Thank you for your very informative blog. 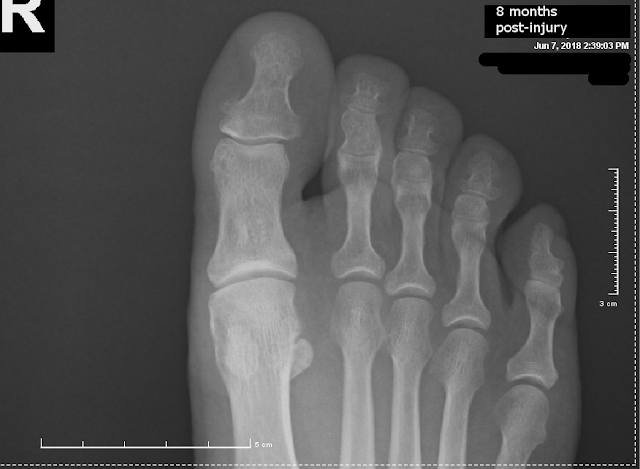 It has more information about sesamoid fractures than most other sources combined. I'm 56 years old and have always been very active outdoors hiking and biking, although I've never been a runner. 12 months ago I felt a pop while squatting during some home repairs. The immediate discomfort was not great and I quickly forgot about it and learned to favor that foot slightly and not squat, thinking it would work itself out. As the weeks and months progressed, so did the discomfort. I never had any discoloration, obvious swelling or point tenderness. The range of motion is good. 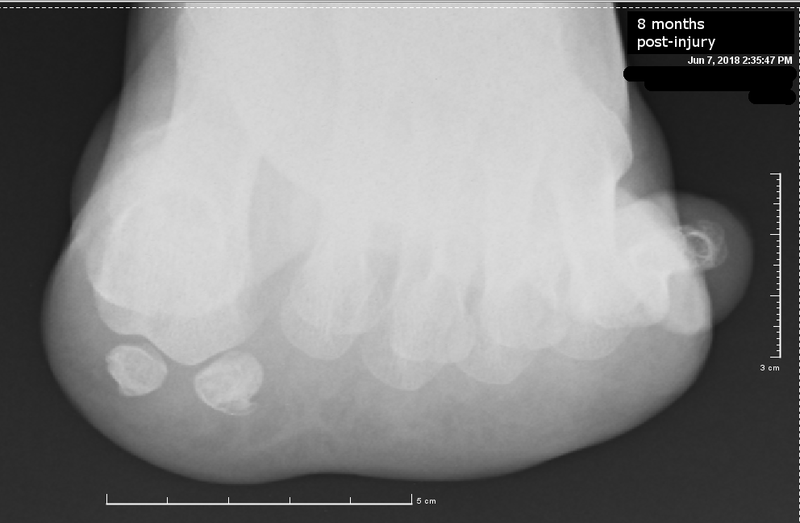 Dr. Blake's comment: That is the history of the big toe joint sprain, not fracture. The sprain is the ligaments in that area and can be the ligaments around the sesamoids or between a bipartite sesamoid. 6 months after the injury I finally got an x-ray with a diagnosis of the fractured lateral sesamoid. The podiatrist said the pieces had moved too far apart to knit back together and gave me a steroid injection to help calm down the tendon. We also put a cut-out dancer's pad under my insoles to relieve pressure around the sesamoids. I started an ice massage 3-5 times/day. The plan has been to let things calm down, then make custom orthotics to replace the dancer's pad. Surgical removal was mentioned as a possibility if things didn't improve. Dr. Blake's comment: Remember, steroid injections give some relief up to 9 months, but they also mask pain which may not be good. By 9 months it was feeling much better and I was able to routinely hike 4-8 miles again, with pain levels in the 0-2 range. I stopped icing. Then I got a new pair of cycling shoes and did ONE RIDE without the relief pad. The next day I noticed slight discomfort had come back and it continued to get worse over the next two weeks. I resumed icing. A new x-ray at 10 months showed the sesamoid remains non-union and I got another steroid injection. As the first injection, it took about 2 weeks before I sensed improvement. 1) Is the steroid injection simply masking symptoms? Dr. Blake' comment: Yes, stop doing those, you can hurt other things by masking the pain. These long-acting cortisone shots, I am assuming this is what you got, work for 9 months. With 2 in your system, you have 7 more months of the shots doing something so it will be May 2019 before they are out of your system. If your symptoms are still good in May, then you will probably be fine. 2) At this point, is there any hope that the sesamoid pieces will heal back together? If not, can I have an active lifestyle (backpacking, mountain biking) with a fractured sesamoid? Dr. Blake's comment: The last 2 xray views show very round edges to the junction which means it was probably a bipartite sesamoid that broke. This means it will never go back, you just want the injury to stabilize and stop hurting. Your injury made sense for a bipartite sesamoid sprain where the two pieces separated more than a fracture. 3) How concerned should I be about the degradation of cartilage on the metatarsal head caused by the rough, fractured edges of the sesamoid? Dr. Blake's comment: I am not sure. 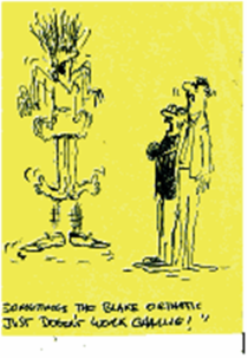 We don't remove the sesamoid for fear of this being a problem. When sesamoids are removed, it is due to the disability the whole problem produces. It can be hard to know exactly what is the trigger of pain in some patients. Sesamoid removals are in so few patients who break their sesamoids, and some heal with a lot of irregularity. Yearly checks on the condition by the treating doc is advised if only to refurbish orthotics and occasionally take x-rays. 4) What symptoms should I be alert for that would indicate avascular necrosis? Is AVN still a risk 1 year after injury? Dr. Blake's comment: Not much of a risk here. Full examination with MRI and CT scan would be required. Bone stimulation for 9 months if any signs. I sure hope this information helps you. I'm emailing x-rays, in case they help if you have a chance to answer. The lateral or fibular sesamoid has definitely been remodeling. The irregularities within the bone show this process. I love the Exogen 5000 bone stim if insurance covers. I also love contrast bathes each evening as a deep flush to the bone to remove swelling that can slow bone healing. I also want you in sesamoid protection nonstop until you are back doing everything for several months.